Today Kia Cranwell is speaking with Phil Earl, Technical Director and Chief Engineer of Global Mine Design Ltd (GMD). GMD is headquartered in the UK, with satellites in Canada and Australia. Phil founded GMD in 2013 in order to develop tools and techniques that allow mine site personnel make educated decisions on the state of their orebody when production planning. A large portion of this work involves mine modelling and operational analysis for which Phil frequently uses PDF3D. PDF3D: Good morning Phil. Mining is a global business. Can you mention in which regions of the world do you go on to site to work with mining engineering teams? GMD: Hi Kia. At Global Mine Design (GMD), our largest projects to date have been in Canada – particularly around the Sudbury region of Northern Ontario, America, and Saudi Arabia. We have smaller projects in Australia and our presence is growing in Europe. It is also an exciting time in the UK, where interest in mining is increasing for the first time in probably 30 years. PDF3D: How does your use of rock mechanics analysis fit into enhancing operational mining operations? GMD: At GMD, we apply geomechanical engineering principles to mining operations and planning. Our preference is to work on operational mines with active sources of ground data, but we also work with clients on large-scale feasibility studies too. Monitoring and understanding ground reaction data gains insight into how the ground reacts to extraction. This is the key to optimised mining plans, and it is our speciality. PDF3D: I’m curious, do you work on open pit or underground mines? GMD: We work on both underground and open pit mines, although we probably have a 70% weighting towards underground. Historically geomechanics specialists were brought in after problems arose, but we aim to thread GMD expertise throughout the planning and operational stages. We’ve been very successful at assisting operational mines adjust to changing conditions through the use of monitoring systems and analysing their contextual data. The nature of stress and deformation characteristics means that execution of an underground mine plan is less straightforward. We help clients who are suffering with difficult ground conditions: we help them understand how and why their orebody reacts the way it does – and how they can move forwards. Interestingly some people think that open pit mining is better suited to long term planning, but we have found our approach successfully carries through to pit mines as well. Our work helps clients gain confidence in their ground conditions to use more focussed designs, which are more resilient in tougher economic climates. PDF3D: I imagine this requires some very specialised gear and analysis software to model a complex mine. Can you mention some of the main packages you use? GMD: The software we use includes CAD packages like AutoCAD and Rhino, as well as analytical packages such as those produced by Rocscience and Itasca. We also use a number of less-common data visualisation packages, such as those produced by Golden Software, and proprietary software from specialists such as the Institute of Mine Seismology. However, sometimes we want to do something that we can’t find in an existing package so we fill in gaps using our own code. Visualisation of complex data streams, such as closure measurements and seismicity is key to how we can get our point of view across and work with site teams and this is why PDF3D is a great program for GMD. It allows us to bring outputs from all of these different software packages together and display them in one file. The ability to use layers, rotate models, and explode features is also great, as it allows our clients to really explore their model and interrogate the results. We get much better feedback from presenting our work in this way than simply providing 2D screenshots. PDF3D: What file exchange format works best for you? GMD: Using a wide variety of software packages often means needing to transfer data between several software packages in multiple steps using sometimes less-than-ideal formats such as .dxf. In fact this is a problem across the whole mining industry, and GMD is currently also involved with the Data Exchange for Mine Software working group of the Global Mining Standards and Guidelines organisation to try and improve file exchange formats. PDF3D is particularly useful because of the wide range of accepted input file formats. This is beneficial because components of the 3D model remain in their native forms and are combined at the PDF stage, limiting the potential for data loss through file conversion. PDF3D: I notice in some of your work you use animation. Can you elaborate on what is represented at each time step? GMD: Some of the most useful discussions we’ve ever had with clients have happened after bringing planning and operational teams together to view an animation of the extraction plan – often before any complex numerical modelling has even taken place. 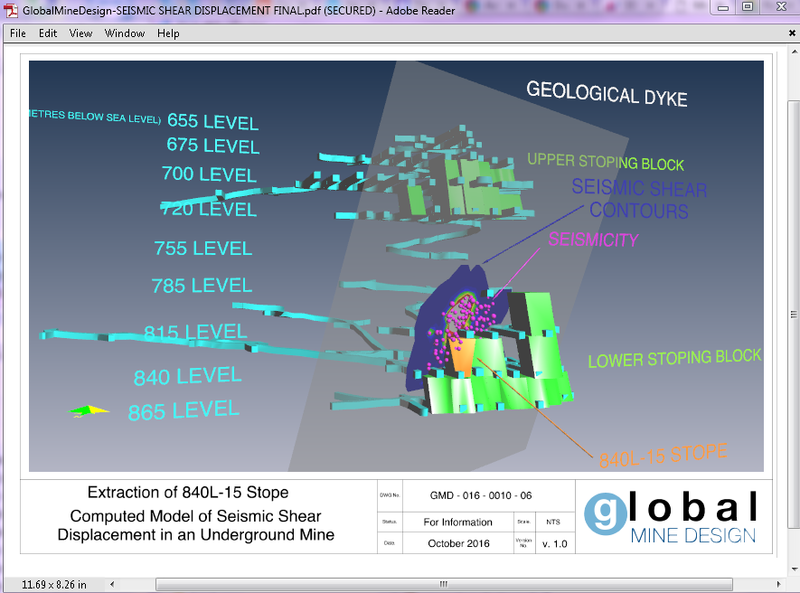 Showing 3D plans sequenced in time allow us to present and discuss potential issues up front and really helps to improve everyone’s understanding of how different mine sequences may impact production output. Visualisation is such a key part of GMD business. Depending on the level of detail necessary, time steps may show full or part excavation of a mining block; or the evolution of scientific phenomena, such as stress isosurfaces or hydraulic drawdown. The point is to show how the mining plan is going to influence whatever parameter is considered important. PDF3D: How is the recent Mac OSX El Capitan edition working for you? GMD: The new OSX version of PDF3D ReportGen has been great so far. GMD is rather unique in that we typically use Apple computers for the majority of our processing and modelling work. There are various reasons for this, but the operating system is very stable and is well suited to our programming languages and other automated processes. We do still use Windows and Linux operating systems for certain programs, but wherever possible we try to use native software. The OSX version of PDF3D ReportGen seems nicely familiar to the Windows version, but being able to create 3D PDFs within the OSX environment definitely helps with keeping our workflows efficient. PDF3D: What do your clients say or comment about 3D PDFs? GMD: We try to incorporate 3D PDFs into our work as much as possible, and we constantly receive positive feedback. Removing page after page of time-stepped screenshots massively reduces the number of report pages required, so our reports are smaller and easier to read. We’ve noticed that a few software packages now provide a built-in 3D PDF output, which shows how important this technology is, but we’ve found generally these are limited because the output can only recreate whatever is in the program in the first instance. The strength of PDF3D is that it can combine the outputs of any number of software programs; it is becoming a nicely polished product with good support, and can be customised towards individual needs. It suits our mind set well. PDF3D: Thank you so much for your time today, Phil. We really appreciate your taking time for this interview. And to all of our readers, thank you for joining us today for today’s PDF3D News interview. Be sure to visit PDF3D.COM to read the latest news, and be sure to sign up for our e-mail newsletter updates. Access new releases and hear about the latest developments, features, offers and news before anyone else. Sign up to our quarterly newsletter. Address: The Bowler Barn, Bartletts Court, Bath Road Littlewick Green, Maidenhead Berkshire SL6 3RX, U.K. COPYRIGHT © 2003-2019, Visual Technology Services Ltd.